Miklós Boskovits (1935–2011), “Grifo di Tancredi/Saint Peter/c. 1310,” Italian Paintings of the Thirteenth and Fourteenth Centuries, NGA Online Editions, https://purl.org/nga/collection/artobject/34 (accessed April 24, 2019). This image, along with Christ Blessing and Saint James Major, originally occupied a single panel. They and two others—one now in a museum in France, the other lost—were cut from the same altarpiece. It would have been an imposing work with triangular gables (see Reconstruction). The considerable dimensions and elaborate ornamental decoration incised on the gold ground suggest that this altarpiece must have been a commission of some importance. 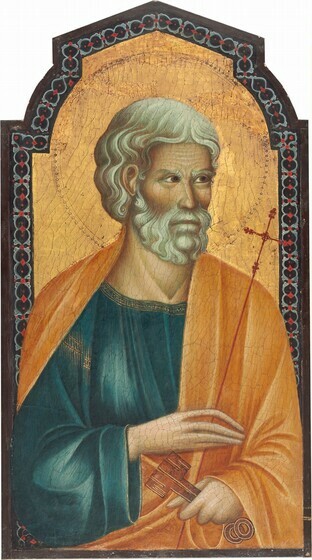 However, the iconographic conventions and technical features (execution on a single panel) are of an archaizing type, which indicates that whoever ordered this painting wanted an artist like Grifo di Tancredi (Italian, active 1271 - 1303 (or possibly 1328)), who worked in a traditional style. The young Giotto's influence was being felt in Florence at that time, but Grifo remained firmly in the orbit of the great Sienese master Cimabue and the artists of Grifo’s own generation. For these artists, producing the illusion of three-dimensional space was not of prime importance, and the influence of Eastern or Byzantine art was key. Grifo’s depiction of Saint Peter, for example, follows Byzantine convention in the light-carved furrows of Peter’s brow, the forked lines rising from the bridge of his nose, the profuse waves of gray curls enlivening his brooding expression, and the saint’s penetrating gaze. Until the late 1980s, Grifo’s identity was unknown. 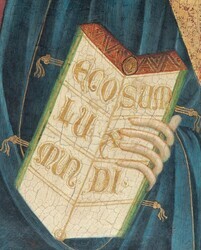 His works had been mostly collected in a group of paintings related to the San Gaggio altarpiece (Galleria dell’Accademia in Florence) assigned to the “Master of San Gaggio,” but a single, difficult-to-read inscription on one of these paintings was deciphered and Grifo was saved from anonymity. Edward B. Garrison, Italian Romanesque Panel Painting: An Illustrated Index (Florence, 1949), 173, observed that the peculiar profile of the former Artaud de Montor panels seems unique among paintings dating to this period. But this does not necessarily imply, as Garrison believed, that it is the result of modern falsification. Nor does Garrison’s doubt regarding the genuineness of the appearance of the paintings in the way they were illustrated in the drawing published in the Artaud de Montor catalog seem justified. It should be borne in mind that the outer frame of the altarpiece has been lost, probably when the figures were separated and their profiles adjusted to the painted internal frame. The external frame originally might have had a different profile, for instance like that of the Sienese triptych no. 11 in the Museum of Fine Arts, Budapest, which still preserves its original mixtilinear external frame while the ornamental border that delimits the upper part of the scenes is trefoil shaped. Another similar case is the Florentine Madonna in the Acton collection in Florence, which originally formed the center of an altarpiece; it too is executed on wood with horizontal graining (cf. Garrison 1949, no. 635). Here, the painted inner frame is arch shaped, whereas the outer frame placed over it is triangular in profile. It is therefore difficult to reconstruct with any precision the original external profile of the polyptych by Grifo di Tancredi. Altarpieces with half-length figures, executed on a single horizontal-grained wooden support, represent an archaic form that Sienese painters abandoned around 1300 but that continued to be used sporadically in Florence in the early decades of the fourteenth century. The best known example is the polyptych of Santa Reparata, produced in Giotto’s shop no earlier than c. 1310; cf. Giorgio Bonsanti and Alfio Del Serra, in Capolavori e restauri (Florence, 1986), 354–357. Cf. also the examples cited in Provenance note 3. Luiz Marques, La peinture du Duecento en Italie centrale (Paris, 1987), 202, 286; Edward B. Garrison, Italian Romanesque Panel Painting: An Illustrated Index (Florence, 1949), 172–173; Angelo Tartuferi, La pittura a Firenze nel Duecento (Florence, 1990), 63, 109; Angelo Tartuferi, “Grifo di Tancredi,” in Dizionario biografico degli italiani, 87 vols. (Rome, 2002), 59:398; Rolf Bagemihl, “Some Thoughts about Grifo di Tancredi of Florence and a Little-­Known Panel at Volterra,” Arte cristiana 87 (1999): 413–414; Sonia Chiodo, “Grifo di Tancredi,” in Allgemeines Künstlerlexikon: Die bildenden Künstler aller Zeiten und Völker, ed. Günter Meißner, 87 vols. (Munich, 2009), 62:129. See also Luisa Marcucci, Gallerie nazionali di Firenze, vol. 1, I dipinti toscani del secolo XIII (Rome, 1958), 56; Hellmut Hager, Die Anfänge des italienischen Altarbildes: Untersuchungen zur Entstehungsgechichte des toskanischen Hochaltarretabels (Munich, 1962), 111–112; Roberto Longhi, “In traccia di alcuni anonimi trecentisti,” Paragone 14 (1963): 10. Even in his first intervention, Roberto Longhi noted in the San Gaggio altarpiece and in the panels now in Washington reflections of the “prime sterzature plastiche del Giotto giovane” (the first turns of the wheel towards the plasticity of the young Giotto). Roberto Longhi, “Giudizio sul Duecento,” Proporzioni 2 (1948): 19. For his part, Luisa Marcucci expressed the view that “l’autore della tavola di San Gaggio, quando la dipinse​ . . . ​aveva già veduto la Madonna [by Giotto] di Ognissanti” (the author of the San Gaggio altarpiece had, when he painted it, already seen Giotto’s Madonna from the Ognissanti), and that this implied that it would date no earlier (or not much earlier) than the second decade of the Trecento. Luisa Marcucci, Gallerie nazionali di Firenze, vol. 1, I di­pinti toscani del secolo XIII (Rome, 1958), 57. For these panels, generally (though not unanimously) assigned to the Master of Santa Cecilia, cf. Richard Offner and Miklós Boskovits, A Critical and Historical Corpus of Florentine Painting: The Fourteenth Century, sec. 3, vol. 1, The St. Cecilia Master and His Circle, new ed. (Florence, 1986), 114–121, 132–137. Term used to denote, since the 15th century, the architecture and, from the 19th century onward, all the visual arts of Europe during a period extending by convention from about 1120 to c. 1400 in central Italy, and until the late 15th century and even well into the 16th century in northern Europe and the Iberian Peninsula. The early gothic style overlapped chronologically with Romanesque and flourished after the onset of Renaissance art in Italy and elsewhere. The term gothic is applied to western European painting of the 13th century to the early 15th century. Unlike gothic architecture, it is distinguished more by developments in style and function than in technique, and even in these areas there is considerable national and regional diversity. The applicability of the term to Italian painting is debated, as is its usefulness in accounting for developments in Netherlandish painting from the early 15th century. Contact with Byzantine art was close in the early 13th century, but after c. 1250 survived principally in the Holy Roman Empire and Italy. —Peter Kidson, Grove Art © Oxford University Press style in Florentine painting, as did the Master of Santa Cecilia (that is, probably Gaddo Gaddi) and Lippo di Benivieni during these same years. The style of the Washington panels suggests that their dating be placed between the first and the second decade of the fourteenth century. But if we are right in assuming that they were intended for the church of Sant’Orsola in Florence, they cannot have been any earlier than 1309. By 1808 in the collection of Alexis-François Artaud de Montor [1772-1849], Paris, who probably purchased the panels during one of his several periods of residence in Italy; (his estate sale, Seigneur and Schroth at Hotel des Ventes Mobilières, Paris, 16-17 January 1851, nos. 35, 36, and 39 [with 1937.1.2.b and .c, as by Margaritone d’Arezzo]); Julien Gréau [1810-1895], Troyes; by inheritance to his daughter, Marie, comtesse Bertrand de Broussillion, Paris; purchased September 1919 by (Duveen Brothers, Inc., Paris, New York, and London); Carl W. Hamilton [1886-1967], New York, by 1920; returned to (Duveen Brothers, Inc.); sold 15 December 1936 to The A.W. Mellon Educational and Charitable Trust, Pittsburgh; gift 1937 to NGA. On Artaud de Montor, apart from the unpublished doctoral dissertation of Roland Beyer for the University of Strasbourg in 1978, see Jacques Perot, "Canova et les diplomates français à Rome. François Cacault et Alexis Artaud de Montor,” Bullettin de la Société de l’Histoire de l’Art français (1980): 219-233, and Andrea Staderini, “Un contesto per la collezione di primitivi di Alexis-François Artaud de Montor (1772-1849),” Proporzioni. Annali della Fondazione Roberto Longhi 5 (2004): 23-62. This information on the post-Artaud de Montor provenance of the work was gleaned at the time Duveen Brothers, Inc., purchased the three panels. See the Duveen prospectus, in NGA curatorial files; Edward Fowles, Memories of Duveen Brothers, London, 1976: 116. Fowles 1976, 116; Duveen Brothers Records, accession number 960015, Research Library, Getty Research Institute, Los Angeles: reel 85, box 230, folder 25, and reel 422. The Duveen record indicates that they purchased the painting in Paris from Hilaire Gréau, a son of Julien Gréau. The three panels were exhibited as “lent by Carl W. Hamilton” in the New York exhibition in 1920. Fern Rusk Shapley (Catalogue of the Italian Paintings, 2 vols., Washington, D.C., 1979: 1:134) also states that they were formerly in the Hamilton collection, and it is reported that “the Cimabue altarpiece was seen in Hamilton’s New York apartment” by 1920 (see Colin Simpson, Artfull Partners. Bernard Berenson and Joseph Duveen, New York, 1986: 199). However, this and other pictures had actually been given to Hamilton on credit by Duveen Brothers (see Meryle Secrest, Duveen. A Life in Art, New York, 2004: 422) and were probably returned to the dealers by 1924, when they were shown as "lent anonymously" at the exhibition of early Italian paintings in American collections held by the Duveen Galleries in New York. The original bill of sale is in Records of The A.W. Mellon Educational and Charitable Trust, Subject Files, box 2, Gallery Archives, NGA; copy in NGA curatorial files. Loan Exhibition of Important Early Italian Paintings in the Possession of Notable American Collectors, Duveen Brothers, New York, 1924, no. 2, as by Giovanni Cimabue (no. 1 in illustrated 1926 version of catalogue). Exposition de L'Art Italien de Cimabue à Tiepolo, Petit Palais, Paris, 1935, no. 110. Berenson and the Connoisseurship of Italian Painting, National Gallery of Art, Washington, D.C., 1979, no. 81. La fortuna dei primitivi: Tesori d’arte dalle collezioni italiane fra Sette e Ottocento [The Fortunes of the Primitives: Artistic Treasures from Italian Collections between the Eighteenth and Nineteenth Centuries], Galleria dell'Accademia, Florence, 2014, no. 79a, repro. That the panels have horizontal grain despite their longitudinal shape suggests that they were painted on a single panel, like some of the earliest polyptychs we know. This is the case with Vigoroso da Siena’s polyptych dated 1291 now in the Galleria Nazionale in Perugia (no. 32), or the altarpiece, now divided in sections, whose central panel belongs to the Museum of Santa Croce in Florence and one lateral component to an unknown private collection—the work of an early fourteenth-century artist close to the Maestro Daddesco. See Miklós Boskovits, A Critical and Historical Corpus of Florentine Painting: The Fourteenth Century, sec. 3, vol. 9, The Miniaturist Tendency (Florence, 1984), 251–252. Analogous is the case of the triptych by Bernardo Daddi, formerly also in Santa Croce and now in the storerooms of the Soprintendenza in Florence, which still remains on its undivided wooden support. See Christoph Merzenich, Vom Schreinerwerk zum Gemälde: Florentiner Altarwerke der ersten Hälfte des Quattrocento (Berlin, 2001), 50. The NGA scientific research department analyzed the paint using x-ray fluorescence spectro­metry (XRF), and the pigments found were consistent with those used in the thirteenth and fourteenth centuries (see report dated August 17, 1988, in NGA conservation files). The ground against which the figures are set is gilt and decorated with punched and hand-incised motifs. The present gold decorations on the drapery of Christ and the inscription on the book are modern, but an older layer of gold is visible under the inscription on the book. Edward B. Garrison was certainly in error when he stated that “the tooling in the gold background​ . . . ​is not original.” Edward B. Garrison, Italian Romanesque Panel Painting: An Illustrated Index (Florence, 1949), 173. There is no reason to affirm, as he did, that the shapes of the panels, when still in Paris, “are impossible in the period” and that the painted borders are all modern. The original appearance of the altarpiece was probably somewhere between Vigo­roso’s above-cited Perugia panel and the one in the Acton collection in Florence (see Garrison 1949, 160 no. 419), though the latter has simple triangular gables over the lateral figures. The surface coating is slightly discolored. Artaud de Montor, Alexis-François. Considérations sur l’état de la peinture en Italie, dans les quatre siècles qui ont précédé celui de Raphaël: par un membre de l’académie de Cortone. Ouvrage servant de catalogue raisonné à une collection de tableaux des XIIe, XIIIe, XIVe et XVe siècles. Paris, 1808: no. 31. Artaud de Montor, Alexis-François. Considérations sur l’état de la peinture en Italie, dans les quatre siècles qui ont précédé celui de Raphaël, par un membre de l’Académie de Cortone (Artaud de Montor). Ouvrage servant de catalogue raisonné à une collection de tableaux des XIIe, XIIIe, XIVe et XVe siècles. Paris, 1811: no. 36. Artaud de Montor, Alexis-François. Peintres primitifs: collection de tableaux rapportée d’Italie. Paris, 1843: no. 36. Berenson, Bernard. "A Newly Discovered Cimabue." Art in America 8 (1920): 251-271, repro. 250. Berenson, Bernard. "Italian Paintings." Bulletin of the Metropolitan Museum of Art 15 (1920): 159-160, repro. Fiftieth Anniversary Exhibition. Loans and Special Features. Exh. cat. Metropolitan Museum of Art, New York, 1920: 8. Robinson, Edward. "The Fiftieth Anniversary Celebration." Bulletin of the Metropolitan Museum of Art 15 (1920): 75. Sirén, Osvald. Toskanische Maler im XIII. Jahrhundert. Berlin, 1922: 299-301, pl. 114. Marle, Raimond van. The Development of the Italian Schools of Painting. 19 vols. The Hague, 1923-1938: 1(1923):476, 574; 5(1925):442, fig. 262. Loan Exhibition of Important Early Italian Paintings in the Possession of Notable American Collectors. Exh. cat. Duveen Brothers, New York, 1924: no. 2. Offner, Richard. "A Remarkable Exhibition of Italian Paintings." The Arts 5 (1924): 241 (repro. ), 244. Vitzthum, Georg Graf, and Wolgang Fritz Volbach. Die Malerei und Plastik des Mittelalters in Italien. Handbuch der Kunstwissenschaft 1. Wildpark-Potsdam, 1924: 249-250. Valentiner, Wilhelm R. A Catalogue of Early Italian Paintings Exhibited at the Duveen Galleries, April to May 1924. New York, 1926: n.p., no. 1, repro. Toesca, Pietro. Il Medioevo. 2 vols. Storia dell’arte italiana, 1. Turin, 1927: 2:1040 n. 48. Berenson, Bernard. Studies in Medieval Painting. New Haven, 1930: 17-31, fig. 14. Fry, Roger. "Mr Berenson on Medieval Painting." The Burlington Magazine for Connoisseurs 58, no. 338 (1931): 245. Venturi, Lionello. Pitture italiane in America. Milan, 1931: no. 8, repro. Berenson, Bernard. Italian Pictures of the Renaissance: A List of the Principal Artists and Their Works with an Index of Places. Oxford, 1932: 150. Marle, Raimond van. Le scuole della pittura italiana. 2 vols. The Hague and Florence, 1932-1934: 1(1932):495-496, fig. 321. Nicholson, Alfred. Cimabue: A Critical Study. Princeton, 1932: 59. Venturi, Lionello. Italian Paintings in America. Translated by Countess Vanden Heuvel and Charles Marriott. 3 vols. New York and Milan, 1933: 1:no. 10, repro. Escholier, Raymond, Ugo Ojetti, Paul Jamot, and Paul Valéry. Exposition de l’art italien de Cimabue à Tiepolo. Exh. cat. Musée du Petit Palais. Paris, 1935: 51. Muratov, Pavel P., and Jean Chuzeville. 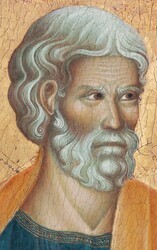 La peinture byzantine. Paris, 1935: 143. Salmi, Mario. "Per il completamento di un politico cimabuesco." Rivista d’arte 17 (1935): 113-120, repro. 115. Serra, Luigi. "La mostra dell’antica arte italiana a Parigi: la pittura." Bollettino d’arte 29 (1935-1936): 31, repro. 33. Berenson, Bernard. Pitture italiane del rinascimento: catalogo dei principali artisti e delle loro opere con un indice dei luoghi. Translated by Emilio Cecchi. Milan, 1936: 129. Coletti, Luigi. I Primitivi. 3 vols. Novara, 1941-1947: 1(1941):37. Duveen Brothers. Duveen Pictures in Public Collections of America. New York, 1941: no. 4, repro., as by Cimabue. Preliminary Catalogue of Paintings and Sculpture. National Gallery of Art, Washington, 1941: 41, no. 2, as by Cimabue. Book of Illustrations. National Gallery of Art, Washington, 1942: 239, repro. 85, as by Cimabue. Sinibaldi, Giulia, and Giulia Brunetti, eds. Pittura italiana del Duecento e Trecento: catalogo della mostra giottesca di Firenze del 1937. Exh. cat. Galleria degli Uffizi. Florence, 1943: 277. Salvini, Roberto. Cimabue. Rome, 1946: 23. Offner, Richard. A Critical and Historical Corpus of Florentine Painting. The Fourteenth Century. Sec. III, Vol. V: Master of San Martino alla Palma; Assistant of Daddi; Master of the Fabriano Altarpiece. New York, 1947: 216 n. 1. Longhi, Roberto. "Giudizio sul Duecento." Proporzioni 2 (1948): 19, 47, fig. 37. Pope-Hennessy, John. "Review of Proporzioni II by Roberto Longhi." The Burlington Magazine 90 (1948): 360. Carli, Enzo. "Cimabue." In Enciclopedia Cattolica. 12 vols. Vatican City, 1949-1954: 3(1949):1614, repro. Garrison, Edward B. Italian Romanesque Panel Painting: An Illustrated Index. Florence, 1949: 172-173, repro. Paintings and Sculpture from the Mellon Collection. National Gallery of Art, Washington, 1949 (reprinted 1953 and 1958): 5, repro. Einstein, Lewis. Looking at Italian Pictures in the National Gallery of Art. Washington, 1951: 16-18, repro., as by Cimabue. Galetti, Ugo, and Ettore Camesasca. Enciclopedia della pittura italiana. 3 vols. Milan, 1951: 1:642; 2:1486. Ragghianti, Carlo Ludovico. Pittura del Dugento a Firenze. Florence, 1955: 127, fig. 186. Laclotte, Michel. De Giotto à Bellini: les primitifs italiens dans les musées de France. Exh. cat. Musée de l’Orangerie, Paris, 1956: 15. Samek Ludovici, Sergio. 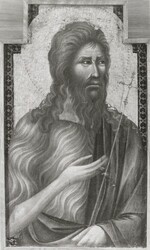 Cimabue. Milan, 1956: 42-44, 48. Marcucci, Luisa. Gallerie nazionali di Firenze. Vol. 1, I dipinti toscani del secolo XIII. Rome, 1958: 56. Salvini, Roberto. "Cimabue." In Enciclopedia Universale dell’Arte. Edited by Istituto per la collaborazione culturale. 15 vols. Florence, 1958-1967: 3(1960):473. Boskovits, Miklós. "Cenni di Pepe (Pepo), detto Cimabue." In Dizionario biografico degli italiani. Edited by Alberto Maria Ghisalberti. 82+ vols. Rome, 1960+: 23(1979):542. Le Musée des Beaux-Arts de Chambéry. Chambéry, 1960: n.p., fig. 15. Longhi, Roberto. "Giudizio sul Duecento (1948)." In Edizione delle opere complete di Roberto Longhi. 14 vols. Florence, 1961-1984: 7(1974):14, 44, pl. 36. Hager, Hellmut. Die Anfänge des italienischen Altarbildes. Untersuchungen zur Entstehungsgechichte des toskanischen Hochaltarretabels. Munich, 1962: 111-112. Berenson, Bernard. Italian Pictures of the Renaissance. Florentine School. 2 vols. London, 1963: 1:50, fig. 4. Longhi, Roberto. "In traccia di alcuni anonimi trecentisti." Paragone 14 (1963): 10. Walker, John. National Gallery of Art, Washington, D.C.. New York, 1963 (reprinted 1964 in French, German, and Spanish): 297, repro., as by Cimabue. Previtali, Giovanni. La fortuna dei primitivi: dal Vasari ai neoclassici. Turin, 1964: 232. Summary Catalogue of European Paintings and Sculpture. National Gallery of Art, Washington, 1965: 28. Previtali, Giovanni. Giotto e la sua bottega. Milan, 1967: 26. Salmi, Mario. "La donazione Contini Bonacossi." Bollettino d’arte 52 (1967): 223, 231 n. 1. European Paintings and Sculpture, Illustrations. National Gallery of Art, Washington, 1968: 21, repro. Volpe, Carlo. "La formazione di Giotto nella cultura di Assisi." In Giotto e i giotteschi in Assisi. Rome, 1969: 38. Fredericksen, Burton B., and Federico Zeri. Census of Pre-Nineteenth Century Italian Paintings in North American Public Collections. Cambridge, Mass., 1972: 54, 403, 440, 645. Previtali, Giovanni. Giotto e la sua bottega. 2nd ed. Milan, 1974: 26. European Paintings: An Illustrated Summary Catalogue. National Gallery of Art, Washington, 1975: 70, repro., as Attributed to Cimabue. Fowles, Edward. Memories of Duveen Brothers. London, 1976: 116. Shapley, Fern Rusk. Catalogue of the Italian Paintings. National Gallery of Art. 2 vols. Washington, 1979: 1:134-135; 2:pl. 94. Pietralunga, Fra Ludovico da, and Pietro Scarpellini (intro. and comm.). Descrizione della Basilica di S. Francesco e di altri Santuari di Assisi. Treviso, 1982: 416. European Paintings: An Illustrated Catalogue. National Gallery of Art, Washington, 1985: 90, repro. Guerrini, Alessandra. "Maestro di San Gaggio." In La Pittura in Italia. Il Duecento e il Trecento. Edited by Enrico Castelnuovo. 2 vols. Milan, 1986: 2:625. Simpson, Colin. Artful Partners: Bernard Berenson and Joseph Duveen. New York, 1986: 199. Marques, Luiz. La peinture du Duecento en Italie centrale. Paris, 1987: 202, 286, fig. 253. Damian, Véronique, and Jean-Claude Giroud. Peintures florentines. Collections du Musée de Chambéry. Chambéry, 1990: 23, 66-67. Tartuferi, Angelo. La pittura a Firenze nel Duecento. Florence, 1990: 63, 109. Chiodo, Sonia. "Grifo di Tancredi." In Allgemeines Künstlerlexikon: Die bildenden Künstler aller Zeiten und Völker. Edited by Günter Meissner. 87+ vols. Munich and Leipzig, 1992+: 62(2009):129. Boskovits, Miklós. A Critical and Historical Corpus of Florentine Painting. Sec. I, Vol. I: The Origins of Florentine Painting, 1100–1270. Florence, 1993: 732 n. 1, 809. Previtali, Giovanni, and Giovanna Ragionieri. Giotto e la sua bottega. Edited by Alessandro Conti. 3rd ed. Milan, 1993: 36. "Artaud de Montor, Jean Alex Francis." In The Dictionary of Art. Edited by Jane Turner. 34 vols. New York and London, 1996: 2:514. Bellosi, Luciano. 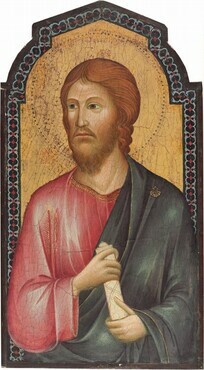 Cimabue. Edited by Giovanna Ragionieri. 1st ed. Milan, 1998: 287, 289. Frinta, Mojmír S. Punched Decoration on Late Medieval Panel and Miniature Painting. Prague, 1998: 442, 443. Bagemihl, Rolf. "Some Thoughts About Grifo di Tancredi of Florence and a Little-Known Panel at Volterra." Arte cristiana 87 (1999): 413-414. Offner, Richard, Miklós Boskovits, Ada Labriola, and Martina Ingendaay Rodio. A Critical and Historical Corpus of Florentine Painting. The Fourteenth Century. Sec. III, Vol. V: Master of San Martino alla Palma; Assistant of Daddi; Master of the Fabriano Altarpiece. 2nd ed. Florence, 2001: 472 n. 1. Tartuferi, Angelo. "Grifo di Tancredi." In Dizionario biografico degli italiani. Edited by Alberto Maria Ghisalberti. 82+ vols. Rome, 1960+: 59(2002):398. Bellosi, Luciano. "La lezione di Giotto." in Storia delle arti in Toscana. Il Trecento. Edited by Max Seidel. Florence, 2004: 96. Secrest, Meryle. Duveen: A Life in Art. New York, 2004: 422. Staderini, Andrea. "Un contesto per la collezione di ‘primitivi’ di Alexis-François Artaud de Montor (1772-1849)." Proporzioni 5 (2004): 38. Leone De Castris, Pierluigi. "Montano d’Arezzo a San Lorenzo." In Le chiese di San Lorenzo e San Domenico: gli ordini mendicanti a Napoli. Edited by Serena Romano and Nicolas Bock. Naples, 2005: 109. Bellosi, Luciano, and Giovanna Ragionieri. Giotto e la sua eredità: Filippo Rusuti, Pietro Cavallini, Duccio, Giovanni da Rimini, Neri da Rimini, Pietro da Rimini, Simone Martini, Pietro Lorenzetti, Ambrogio Lorenzetti, Matteo Giovannetti, Masso di Banco, Puccio Capanna, Taddeo Gaddi, Giovanni da Milano, Giottino, Giusto de’Menabuoi, Altichiero, Jacopo Avanzi, Jean Pucelle, i Fratelli Limbourg. Florence, 2007: 68, fig. 42. Tartuferi, Angelo, and Gianluca Tormen. La fortuna dei primitivi: Tesori d’arte dalle collezioni italiane fra Sette e Ottocento. Exh. cat. Galleria dell’Accademia. Florence, 2014: 427-429, repros. Boskovits, Miklós. Italian Paintings of the Thirteenth and Fourteenth Centuries. The Systematic Catalogue of the National Gallery of Art. Washington, 2016: 177-188, color repro. Véronique Damian and Jean-Claude Giroud, Peintures florentines, Collections du Musée de Chambéry (Chambéry, 1990), 66–67. The panel entered the museum in 1914 as a gift of Leonce Mesnard. I have been unable to establish the painting’s fate in the time period between the 1851 sale and 1914. The fate of this painting is also unknown. It never resurfaced after its sale at the abovementioned auction. However, the drawing of it published in the Artaud de Montor catalog (1843) suffices to show that the collector’s identification of the crowned female saint with Saint Clare of Assisi was mistaken. The martyr saint in question is clearly of royal birth, if not a queen; George Kaftal plausibly recognized her as Saint Ursula. George Kaftal, Saints in Italian Art, vol. 1, Iconography of the Saints in Tuscan Painting (Florence, 1952), 996. While the adult Christ appears with some frequency at the center of altarpieces, at least in the area of Lazio, in the twelfth and thirteenth centuries, this iconography is rarer in Tuscany, where the center panel or compartment is usually filled with the Madonna and Child. Cf. Edward B. Garrison, Italian Romanesque Panel Painting: An Illustrated Index (Florence, 1949), nos. 278, 279, 280, 298, 305. Significant exceptions are Meliore’s altarpiece in the Uffizi, Florence (no. 9153); that in the Museo Nazionale in Pisa (no. 1582) and dating to the early years of the Trecento; and Giotto’s polyptych now in the North Carolina Museum of Art at Raleigh, no. GL. 60.17.7. Other sui generis cases are presented by the Stefaneschi altarpiece in the Pinacoteca Vaticana, executed for Saint Peter’s basilica in Rome and hence reflecting local iconographic conventions, and the polyptych of Taddeo Gaddi formerly in the Bromley Davenport collection, in which the central image represents not the blessing Christ but the Vir dolorum. For the latter painting, see Andrew Ladis, Taddeo Gaddi: Critical Reappraisal and Catalogue Raisonné (Columbia, MO, 1982), 20–21. Yet after the early decades of the fourteenth century, altarpieces with Christ at the center disappear completely, only to reappear sporadically in the second half of the century; cf. Millard Meiss, Painting in Florence and Siena after the Black Death (Princeton, 1951), 9–10. P. N. Cianfogni and Domenico Moreni, Memorie istoriche dell’Ambrosiana R. Basilica di S. Lorenzo di Firenze, 3 vols. (Florence, 1804), 1:136–139. In Florence, panels with similarly decorated gold grounds are found especially in representations of the Maestà. We may cite, for example, the three versions of the Maestà that have come down to us from the hand of Cimabue, Duccio’s Madonna Rucellai, or the altarpiece of the Magdalen Master in the church of San Michele at Rovezzano near Florence. See Luciano Bellosi, Cimabue, ed. Giovanna Ragionieri (Milan, 1998a), 105–112, 132, 136, 248; and Angelo Tartuferi, La pittura a Firenze nel Duecento (Florence, 1990), pl. 163. It is worth pointing out, however, that the Lucchese master Deodato Orlandi also used this type of decoration on horizontal altarpieces with half-length figures of saints. Examples include the one dated 1300 now in the Museo Nazionale in Pisa (no. 1586); the dismembered and dispersed polyptych of which the center panel is known, formerly in the Hurd collection in New York, inscribed with the date 1308; and even in a portable tabernacle, like that now in the Gemäldegalerie in Berlin. See Mariagiulia Burresi and Antonino Caleca, eds., Cimabue a Pisa: La pittura pisana del Duecento da Giunta a Giotto (Pisa, 2005), 260–261; Edward B. Garrison, Italian Romanesque Panel Painting: An Illustrated Index (Florence, 1949), 160 no. 418; Miklós Boskovits, ed., Frühe italienische Malerei: Gemäldega­lerie Berlin, Katalog der Gemälde, trans. Erich Schleier (Berlin, 1988), 256–259. Edward B. Garrison, Italian Romanesque Panel Painting: An Illustrated Index (Florence, 1949), 173, observed that the peculiar profile of the former Artaud de Montor panels seems unique among paintings dating to this period. But this does not necessarily imply, as Garrison believed, that it is the result of modern falsification. Nor does Garrison’s doubt regarding the genuineness of the appearance of the paintings in the way they were illustrated in the drawing published in the Artaud de Montor catalog seem justified. It should be borne in mind that the outer frame of the altarpiece has been lost, probably when the figures were separated and their profiles adjusted to the painted internal frame. The external frame originally might have had a different profile, for instance like that of the Sienese triptych no. 11 in the Museum of Fine Arts, Budapest, which still preserves its original mixtilinear external frame while the ornamental border that delimits the upper part of the scenes is trefoil shaped. Another similar case is the Florentine Madonna in the Acton collection in Florence, which originally formed the center of an altarpiece; it too is executed on wood with horizontal graining (cf. Garrison 1949, no. 635). Here, the painted inner frame is arch shaped, whereas the outer frame placed over it is triangular in profile. It is therefore difficult to reconstruct with any precision the original external profile of the polyptych by Grifo di Tancredi. Altarpieces with half-length figures, executed on a single horizontal-grained wooden support, represent an archaic form that Sienese painters abandoned around 1300 but that continued to be used sporadically in Florence in the early decades of the fourteenth century. The best known example is the polyptych of Santa Reparata, produced in Giotto’s shop no earlier than c. 1310; cf. Giorgio Bonsanti and Alfio Del Serra, in Capolavori e restauri (Florence, 1986), 354–357. Cf. also the examples cited in Provenance note 3. Alexis-François Artaud de Montor, Considérations sur l’état de la peinture en Italie, dans les quatre siècles qui ont précédé celui de Raphaël: Par un membre de l’académie de Cortone; Ouvrage servant de catalogue raisonné à une collection de tableaux des XIIe, XIIIe, XIVe et XVe siècles (Paris, 1808), nos. 30, 31, 34; Alexis-François Artaud de Montor, Considérations sur l’état de la peinture en Italie, dans les quatre siècles qui ont précédé celui de Raphaël, par un membre de l’Académie de Cortone (Artaud de Montor): Ouvrage servant de catalogue raisonné à une collection de tableaux des XIIe, XIIIe, XIVe et XVe siècles (Paris, 1811), nos. 35, 36, 39; Alexis-François Artaud de Montor, Peintres primitifs: Collection de tableaux rapportée d’Italie (Paris, 1843), nos. 35, 36, 39. Bernard Berenson, “A Newly Discovered Cimabue,” Art in America 8 (1920): 250–271. Miklós Boskovits, A Critical and Historical Corpus of Florentine Painting, sec. 1, vol. 1, The Origins of Florentine Painting, 1100 – ​1270 (Florence 1993), 142–144, 726–733. The mosaics of the Florentine church, executed in the 1270s probably by the Master of Sant’Agata, were restored for the first time in 1297 and then later as well. They are now rather difficult to read, but the figure of Christ, which Berenson compared with the Christ in the Washington painting, belongs to the earliest phase of the program. See Miklós Boskovits, A Critical and Historical Corpus of Florentine Painting, Sec. i, vol. ii, The Mosaics of the Baptistery of Florena (Florence 2007), 207 n. 158, 603–607. Roberto Paolo Novello, “I mosaici,” in Il Duomo di Pisa, ed. Adriano Peroni, 3 vols. (Modena, 1995), 1:286–287, 556–558. Alessio Monciatti, in La basilica di San Francesco ad Assisi, ed. Giorgio Bonsanti (Modena, 2002), 503–504. Fiftieth Anniversary Exhibition: Loans and Special Features (New York, 1920), unnumbered catalog; Loan Exhibition of Important Early Italian Paintings in the Possession of Notable American Collectors (New York, 1924), no. 2; and Raymond Escholier et al., Exposition de l’art italien de Cimabue à Tiepolo (Paris, 1935), 51. This is the panel from the church of Santa Trinita (no. 8343), variously dated. More recent scholarship has tended to date it to the last decade of the thirteenth century; cf. Luciano Bellosi, Cimabue, ed. Giovanna Ragionieri (Milan, 1998), 249–256. Lionello Venturi, Pitture italiane in America (Milan, 1931), no. 8; Lionello Venturi, Italian Paintings in America, trans. Countess Vanden Heuvel and Charles Marriott, 3 vols. (New York and Milan, 1933), 1: no. 10; Enzo Carli, “Cimabue,” in Enciclopedia cattolica, 12 vols. (Florence, 1949), 3:1614; Pietro Toesca, Il medioevo, 2 vols., Storia dell’arte italiana 1 (Turin, 1927), 2:1040 n. 48; Luigi Coletti, I Primitivi, vol. 1, 120 tavole (Novara, 1941), 37. Raimond van Marle, The Development of the Italian Schools of Painting, vol. 1, From the 6th Until the End of the 13th Century (The Hague, 1923), 476, 574; Raimond van Marle, The Development of the Italian Schools of Painting, vol. 5, The Local Schools of Central and Southern Italy of the 14th Century (The Hague, 1925), 442, fig. 262; Raimond van Marle, Le scuole della pittura italiana, vol. 1, Dal VI alla fine del XIII secolo (The Hague, 1932), 495–496, fig. 321; Richard Offner, “A Remarkable Exhibition of Italian Paintings,” The Arts 5 (1924): 244. Mario Salmi, “Per il completamento di un politico cimabuesco,” Rivista d’arte 17 (1935): 114. Roberto Longhi, “Giudizio sul Duecento,” Proporzioni 2 (1948): 19, 47. See Angelo Tartuferi, in Dipinti, vol. 1, Dal Duecento a Giovanni da Milano, Cataloghi della Galleria dell’Accademia di Firenze, ed. Miklós Boskovits and Angelo Tartuferi (Florence, 2003), 94–98. Bernard Berenson, Italian Pictures of the Renaissance: Florentine School, 2 vols. (London, 1963), 1:50. The following authorities spoke of “school” or “following” of Cimabue: Giulia Sinibaldi and Giulia Brunetti, eds., Pittura italiana del Duecento e Trecento: Catalogo della mostra giottesca di Firenze del 1937 (Florence, 1943), 277; Roberto Salvini, Cimabue (Rome, 1946), 23; Roberto Salvini, “Cimabue,” in Enciclopedia Universale dell’Arte, ed. Istituto per la collaborazione culturale, 15 vols. (Florence, 1960), 3:473; Richard Offner, A Critical and Historical Corpus of Florentine Painting: The Fourteenth Century, sec. 3, vol. 5, Bernardo Daddi and His Circle, ed. Miklós Boskovits, Ada Labriola, and Martina Ingendaay Rodio, new ed. (Florence, 2001), 472 n. 1; Edward B. Garrison, Ita­lian Romanesque Panel Painting: An Illustrated Index (Florence, 1949), 172–173; Millard Meiss, Painting in Florence and Siena after the Black Death (Princeton, 1951), 9 n. 2; Carlo Ludovico Ragghianti, Pittura del Dugento a Firenze (Florence, 1955), 127; Sergio Samek Ludovici, Cimabue (Milan, 1956), 42–44; Hellmut Hager, Die Anfänge des ita­lienischen Altarbildes: Untersuchungen zur Entstehungsgechichte des toskanischen Hochaltarretabels (Munich, 1962), 111–112; Mario Salmi, “La donazio­ne Contini Bonacossi,” Bollettino d’arte 52 (1967): 223; Burton B. Fredericksen and Federico Zeri, Census of Pre-­Nineteenth-­Century Italian Paintings in North American Public Collections (Cambridge, MA, 1972), 54, 403, 440, 645; Enio Sindona, L’opera completa di Cimabue e il momento figurativo pregiottesco (Milan, 1975), 119–120; Fern Rusk Shapley, Catalogue of the Italian Paintings, 2 vols. (Washington, DC, 1979), 1:134–135; Meryle Secrest, Duveen: A Life in Art (New York, 2004), 422. Longhi’s 1963 attribution to the Master of San Gaggio, in Roberto Longhi, “In traccia di alcuni anonimi trecentisti,” Paragone 14 (1963): 10, was accepted in turn by Ugo Galetti and Ettore Camesasca, Enciclopedia della pittura italiana, 3 vols. (Milan, 1951), 2:1486 (though the three paintings were also listed among the works of Cimabue on p. 672 of the same publication); Michel Laclotte, De Giotto à Bellini: Les primitifs italiens dans les musées de France (Paris, 1956), 15; Luisa Marcucci, Gallerie nazionali di Firenze, vol. 1, I dipinti toscani del secolo XIII (Rome, 1958), 56; Luisa Marcucci, in Le Musée des Beaux-­Arts de Chambéry (Chambéry, 1960), n.p., fig. 15; Giovanni Previtali, La fortuna dei primitivi: Dal Vasari ai neoclassici (Turin, 1964), 232; Giovanni Previtali, Giotto e la sua bottega (Milan, 1967), 26; Carlo Volpe, “La formazione di Giotto nella cultura di Assisi,” in Giotto e i giotteschi in Assisi (Rome, 1969), 38; Miklós Boskovits, “Cenni di Pepe (Pepo), detto Cima­bue,” in Dizionario biografico degli ita­liani, 82 vols. (Rome, 1979), 23:452; Fra Ludovico da Pietralunga and Pietro Scarpellini, Descrizione della Basilica di S. Francesco e di altri Santuari di Assisi (Treviso, 1982), 416; Alessandra Guerrini, “Maestro di San Gaggio,” in La Pittura in Italia: Il Duecento e il Trecento, ed. Enrico Castelnuovo, 2 vols. (Milan, 1986), 2:625; Luiz Marques, La peinture du Duecento en Italie centrale (Paris, 1987), 202, 286; Angelo Tartuferi, La pittura a Firenze nel Duecento (Florence, 1990), 63, 109; Véronique Damian and Jean-­Claude Giroud, Peintures florentines, Collections du Musée de Chambéry (Chambéry, 1990), 23, 66–67; “Artaud de Montor, Jean Alex Francis,” in The Dictionary of Art, ed. Jane Turner, 34 vols. (New York, 1996), 2:514. Miklós Boskovits, ed., Frühe italienische Malerei: Gemäldegalerie Berlin, Katalog der Gemälde, trans. Erich Schleier (Berlin, 1988), 122, proposed an integration of the fragmentary inscription of the triptych in the collection of the Earl of Crawford and Balcarres. Miklós Boskovits, A Critical and Historical Corpus of Florentine Painting, sec. 1, vol. 1, The Origins of Florentine Painting, 1100–1270 (Florence 1993), 732 n. 1, 809; Luciano Bellosi, Cimabue, ed. Giovanna Ragionieri (Milan, 1998), 129; Luciano Bellosi, “La lezione di Giotto,” in Storia delle arti in Toscana: Il Trecento, ed. Max Seidel (Florence, 2004), 96; Rolf Bagemihl, “Some Thoughts about Grifo di Tancredi of Florence and a Little-­Known Panel at Volterra,” Arte cristiana 87 (1999): 413–414; Angelo Tartuferi, “Grifo di Tancredi,” in Dizionario biografico degli italiani, 82 vols. (Rome, 2002), 59:398; Sonia Chiodo, in L’arte a Firenze nell’età di Dante (1250–1300), ed. Angelo Tartuferi and Mario Scalini (Florence, 2004), 110–114; Andrea Staderini, “Un contesto per la collezione di ‘primitivi’ di Alexis-­François Artaud de Montor (1772–1849),” Proporzioni 5 (2004): 38; Pierluigi Leone De Castris, “Montano d’Arezzo a San Lorenzo,” in Le chiese di San Lorenzo e San Domenico: Gli ordini mendicanti a Napoli, ed. Serena Romano and Nicolas Bock (Naples, 2005), 109. The monastery of the Augustinian nuns dedicated to San Gaggio (= Caius), sometimes described as having been founded in the fourteenth century, in fact already existed in the 1270s, as demonstrated by a testament of 1274; cf. Guido Carocci, I dintorni di Firenze, vol. 2, Sulla sinistra dell’Arno (Florence, 1907), 289; Robert Davidsohn, Forschungen zur älteren Geschichte von Florenz, 4 vols. (Berlin, 1896), 4:416. At that time, the community of cloistered nuns, called “donne rinkiuse di San Gaggio,” probably was very small; perhaps they did not even have their own church. That such a church presumably existed around the turn of the century can, however, be inferred from documents of 1299 and 1304, cited by Domenico Moreni, Notizie istoriche dei contorni di Firenze, vol. 6, Dalla Porta a Pinti fino a Settignano (Florence, 1795), 207, which speak of a monastero and its badessa. Grifo’s painting, a Maestà, judging from its fame and size, cannot have been destined for the high altar: instead, it adorned the meeting place of a religious confraternity in the church; cf. Hans Belting, Bild und Kult: Eine Geschichte des Bildes vor dem Zeitalter der Kunst (Munich, 1990), 433–446. It therefore presupposes the existence of a church open to the public and for this reason additionally seems more likely to date after than before c. 1300. No. 6115 of the Galleria dell’Accademia was attributed to the Master of Santa Cecilia by Mario Salmi, “Spigolature d’arte toscana,” L’Arte 16 (1913): 209–210; Raimond van Marle, The Development of the Italian Schools of Painting, vol. 2, The Sienese School of the 14th Century (The Hague, 1924), 293–294; Ugo Procacci, La R. Galleria dell’Accademia di Firenze (Rome, 1936), 22. On the other hand, Roberto Longhi noted in a youthful polyptych by Pacino di Bonaguida, now in the collection of the Cassa di Risparmio of Florence, “un aspetto torvo simile a quello datoci” (a surly expression similar to the one given to us) by the “Maestro di San Gaggio” in the former Artaud de Montor altarpiece. Roberto Longhi, “In traccia di alcuni anonimi trecentisti,” Paragone 14 (1963): 10. Painters of the thirteenth century often represented the blessing Christ with a closed book in his hand. In contrast, examples of Christ holding an open book reveal the problems involved in foreshortening. It is enough to mention in this regard the already cited altarpiece in the Museo Nazionale in Pisa and the mosaic of Magister Francesco in the apse of Pisa Cathedral. 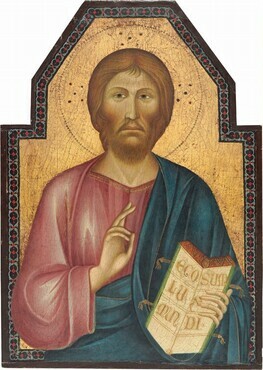 See Mariagiulia Burresi and Antonino Caleca, eds., Cimabue a Pisa: La pittura pisana del Duecento da Giunta a Giotto (Pisa, 2005), 202–203; Adriano Peroni, ed., Il Duomo di Pisa, 3 vols. (Modena, 1995), 2, pt. 2: pl. 1571. Richard Offner, “A Remarkable Exhibition of Italian Paintings,” The Arts 5 (1924): 244. Fern Rusk Shapley, Catalogue of the Italian Paintings, 2 vols. (Washington, DC, 1979), 1:134. The NGA scientific research department analyzed the wood using cross-sections (see report dated August 17, 1988, in NGA conservation files). Alexis-­François Artaud de Montor, Peintres primitifs: Collection de tableaux rapportée d’Italie (Paris, 1843), 30–31. Duveen Brothers Records, accession number 960015, Research Library, Getty Research Institute, Los Angeles: reel 85, box 230, folder 25, document the commission of the frame but not the paintings’ treatment. The NGA scientific research department analyzed the paint using x-ray fluorescence spectro­metry (XRF), and the pigments found were consistent with those used in the thirteenth and fourteenth centuries (see report dated August 17, 1988, in NGA conservation files). Edward B. Garrison was certainly in error when he stated that “the tooling in the gold background​ . . . ​is not original.” Edward B. Garrison, Italian Romanesque Panel Painting: An Illustrated Index (Florence, 1949), 173. There is no reason to affirm, as he did, that the shapes of the panels, when still in Paris, “are impossible in the period” and that the painted borders are all modern. The original appearance of the altarpiece was probably somewhere between Vigo­roso’s above-cited Perugia panel and the one in the Acton collection in Florence (see Garrison 1949, 160 no. 419), though the latter has simple triangular gables over the lateral figures.